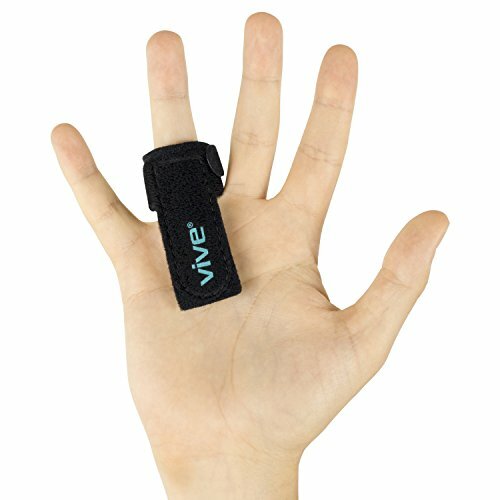 Find relief from stenosing tenosynovitis, or trigger finger with a Vive trigger finger splint. For use on any finger, the aluminum splint supports the finger, reducing stiffness, and preventing the locking up, or catching of the tendons. A breathable neoprene material holds the splint in place with extra strong fasteners for a secure fit throughout daily activities. The universal trigger finger splint design can be worn on any finger, index, middle, ring or pinky, on either hand. Fasteners allow the splint to be easily adjusted for the perfect fit accommodating finger widths up to 3". Producing a secure fit, fasteners are extra strong to reduce slipping and bunching. Provides effective relief from stenosing tenosynovitis, or trigger finger. Splint supports the finger to reduce stiffness and to prevent the finger joint from locking up or catching. Lightweight aluminum brace is integrated in the breathable neoprene wrap to provide superior support for stiff fingers. The rigid aluminum brace prevents tendons from catching and the joint from bending to promote healing and reduce pain and discomfort. Constructed with a lightweight breathable neoprene, the trigger finger splint will not slide or bunch. The breathable material wicks away moisture for comfort day and night. ONE SIZE FITS 4 FINGERS AND THUMB: The universal trigger finger splint design can be worn on any finger, index, middle, ring or pinky, on either hand. Fasteners allow the splint to be easily adjusted for the perfect fit accommodating finger widths up to 3". Producing a secure fit, fasteners are extra strong to reduce slipping and bunching. EFFECTIVE TRIGGER FINGER RELIEF: Provides effective relief from stenosing tenosynovitis, or trigger finger. Splint supports the finger to reduce stiffness and to prevent the finger joint from locking up or catching. BUILT IN ALUMINUM SUPPORT: Lightweight aluminum brace is integrated in the breathable neoprene wrap to provide superior support for stiff fingers. The rigid aluminum brace prevents tendons from catching and the joint from bending to promote healing and reduce pain and discomfort. BREATHABLE MATERIAL FOR ALL DAY COMFORT: Constructed with a lightweight breathable neoprene, the trigger finger splint will not slide or bunch. The breathable material wicks away moisture for comfort day and night.